Jose Mourinho celebrated last weekend’s win at Liverpool by stressing (a.k.a gloating) that Chelsea had completed Premier League doubles in the 2013-14 season over Liverpool and Manchester City. And yes, indeed, Chelsea are well clear when it comes to their record against fellow top-seven sides compared to other top-seven sides against each other. But while Chelsea are the best against the best, they are the worst of the best against the rest. Bottom of the pile. Sub-standard. Lacking. Not what you might call special. And arguably that has or will cost them the title this season. The first graphic is self-explanatory but it shows Chelsea winning eight and losing only one of 12 games against fellow top-seven sides at an average of 2.25 points per game. And it shows them picking up fewer points per game against the ‘other 13′ – the ‘lesser teams’, at 2.13 points per game. Five defeats in particular against the ‘other 13′ have cost them dear: defeats at Newcastle, Stoke, Villa, Palace and then of course at home to Sunderland. None of the other top seven have lost more than three games against the ‘other 13′. A significant aside to Chelsea’s record in this regard in Manchester United’s. They have won just one (that’s ONE) of 12 games against fellow top-seven teams this season. 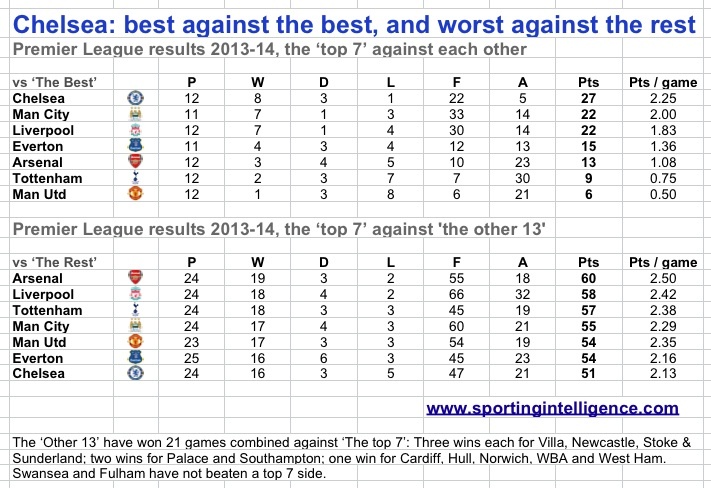 And note that Arsenal are best against the rest, but not great against the best. While Mourinho may be right to boast of Chelsea’s doubles over Liverpool and City, there are four clubs that can boast of more doubles this season than Chelsea. 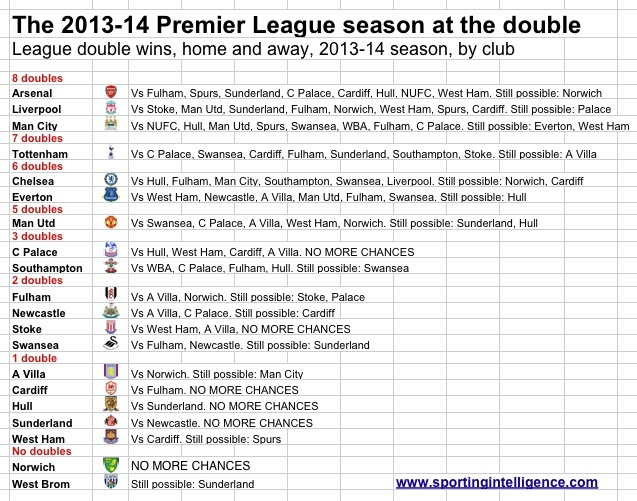 Here’s our complete guide to the doubles achieved so far this season and notes of doubles still possible this season.